This is the web site of the Zichydorf Village Association. We are dedicated to the history and family histories of our ethnic German ancestors who originated from this town and its surrounding towns lying in modern Serbia. To learn more about our town and our organization, please see About ZVA in the main menu. ZVA keeps the memory of Zichydorf and its people alive on its web site through your generosity. It also provides information on many associated villages. Please help us keep the site alive by paying our annual membership fee of a paltry $10. Membership is based on the calendar year. Please check your dues status on the web site. Log in and go to “Your Profile” in the user menu and scroll down to "Dues paid to the end of: ____" If you have not yet paid for 2019, please remit your dues using one of the options described on the Membership page. I will downgrade unrenewed members on the web site in April of each year to give you plenty of grace. From September on, I will credit new members for the following year. If you are not connected to the Internet, send your dues to the address below and I will update you. Thanks for contributing to our common cause. Stasa encountered too much uncertainty to go ahead with a May Banat tour, but he is confident that a September tour will go ahead. Find more information on our home page. As noted in our last letter, Helmut has taken down the genealogy information from his site due to potential liability under the European General Data Protection Regulations. Some other information remains on the site at http://zichydorf.ferienwohnung-otterberg.de. Helmut had also contributed the Zichydorf data (but not the other villages that he compiled) to the genealogy.net site. He had asked that his data be taken down there too, but they have not acted, so it remains available there. Go to http://www.ortsfamilienbuecher.de/index.php and scroll down to the Banat section. Helmut will also answer individual requests if you contact him through his web site. He has also provided up-to-date copies of all his information to me. "On 13 October 2018, a day of remembrance of innocent Donauscwhaben victims was observed, at the memorial "Telečka" and a wreath was laid for those victims by Istvan Pastor, the President of the Provincial Assembly of Vojvodina on behalf of the Provincial parliament. In his speech on this remembrance of the 70 years from disbanding of the concentration camp in Knićanin (Rudolfsgnad), which was established after the WWII, president Pastor reminded that more of 12000 people lost their lives, mostly women, elderly and children of German ethnicity ... etc." A new book by this name is now available on Amazon (and probably other bookseller sites). A description and ordering information can be found at https://www.amazon.com/Banat-Timisoara-European-Melting-Pot/dp/1785511246 in the USA and https://www.amazon.ca/Banat-TimisoaraEuropeanMeltingPot/dp/1785511246/ref=sr_1_fkmrnull_1?keywords=the+banat+of+timisoara&qid=1553271371&s=books&sr=1-1-fkmrnull in Canada. I have just received the copy purchased for our library but have only been able to thumb through it quickly. It is an impressive volume – 435 pages plus end notes. It is not exactly a history book, although it covers the time from the occupation by the Turks to Romania’s overthrow of the Communist Party government in 1989. Rather, its 23 chapters are a series of essays by twelve experts covering various times and aspects of history, as well as art, architecture, religion, and education. 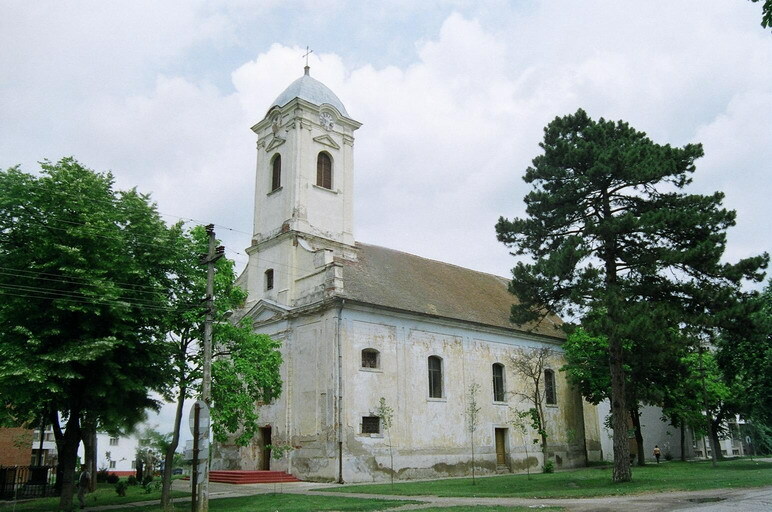 Its treatment of more modern history after the partition of Banat in 1918 is mostly focused on the Romanian Banat and does not deal with the treatment of the German people in Yugoslavia after World War II. It includes several colour pictures of historical figures and maps. A couple of years ago we were forced to upgrade our web site software to be compatible with an upgrade of our host. At the time we did not have a solution for the Photos portion of our site. We have now found a solution, but it will take some time to implement. I won’t know how long it will take until I get started and get a feel for it and I am not sure when I can get started, but it will happen over the next several weeks. Photos will be a Members Only section. From the AKdFF: The family book for Bogarosch 1769-1918, including updates and additional information, has been posted to the Bogarosch HOG website. See https://www.bogarosch.eu for the HOG web site and http://bogarosch.eu/familienbuch.html for the familienbuch. Last October we lost one of our earliest, most dedicated, and long-serving members, Carol Ortman. Regina Branch will meet at 7:30 p.m. on Tuesday, April 23, at Access Communications, 2250 Park St. (north door by the ball diamonds). Please press the buzzer to notify an employee to open the door. Election of officers is on the agenda. Elisabeth Grob-Hugel will speak about her family history, their experience in Yugoslavia at the end of World War II, and their immigration to Canada in 1952. Please mark your calendar and bring along a Zichydorf friend. It is vitally important to have local expertise and a local interpretter when operating in Serbia and/or Romania. ZVA has had excellent experience with two individuals in Banat: Staša Cvetković and Sorin Fortiu.